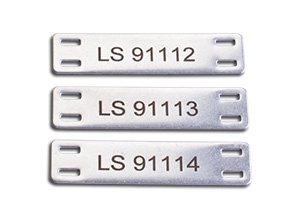 Our signs and cable marks in stainless steel are made in standard sizes. This speeds up the production time so that we can send your metal signs the same day! No matter how big the order is. We use stainless steel of AISI-316/SIS 2348 quality. It is 1.0 mm thick for signs and 0.7 mm for cable marks. The steel is engraved with laser technology and gives a marking that can endure the harshest of environments, like industrial environments with high temperature and acid fluids. Or in marine environments where salt and wind will do its best to effect the sign. Metal signs are also suitable as machine signs to guarantee that the sign will be readable, even if something unfortunate would happen to the machine. When you order metal signs in SignStudio you can choose from a large number of sizes (see below), you choose holes, fonts and much more. Type the text in or use the Excel-important. Complete your order with stainless screws, bits and stripes. If you need metal signs besides in our standard sizes you can easily create it in Sign Studio Advanced.